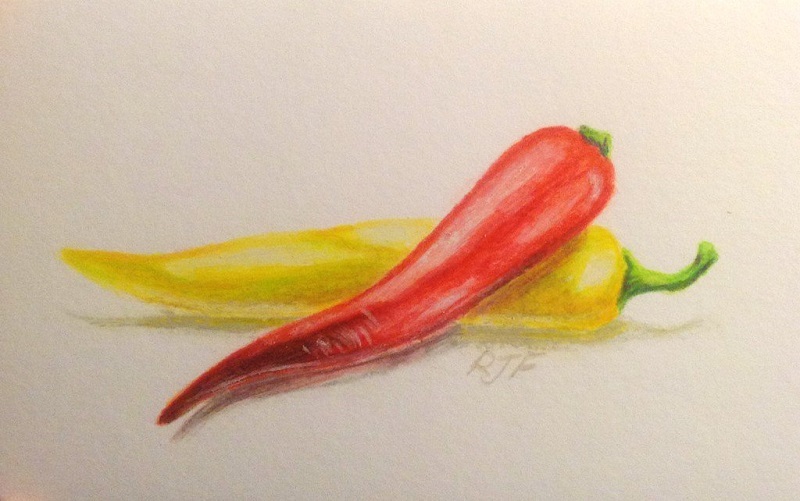 While cutting up vegetables for dinner, I decided to use two of the chili peppers I was going to cook as the basis for a small still life sketch. I had new little sketchbook and some Prismacolor Premier watercolour pencils that had been sitting around for ages unused, so I thought it’d be a good way to do a demonstration and put together a review post for the pencils. That review will be posted shortly, but I wasn’t impressed with the pencils at all (for reasons I’ll discuss in the review) so I’d recommend doing this exercise with whatever other watercolour pencils you already have rather than going out and buying Prismacolor Premiers. It should be easy to find similar colours to those listed here in your preferred brand. Any small round watercolour brushes (sizes 1-4) will do. I used two small Isabey sables and an Escoda Grafilo. -I used Stillman & Birn Beta sketchbook, however this didn’t have much tooth and as a result I couldn’t apply as many layers as I would have liked. I would recommended a more textured paper like Stonehenge. 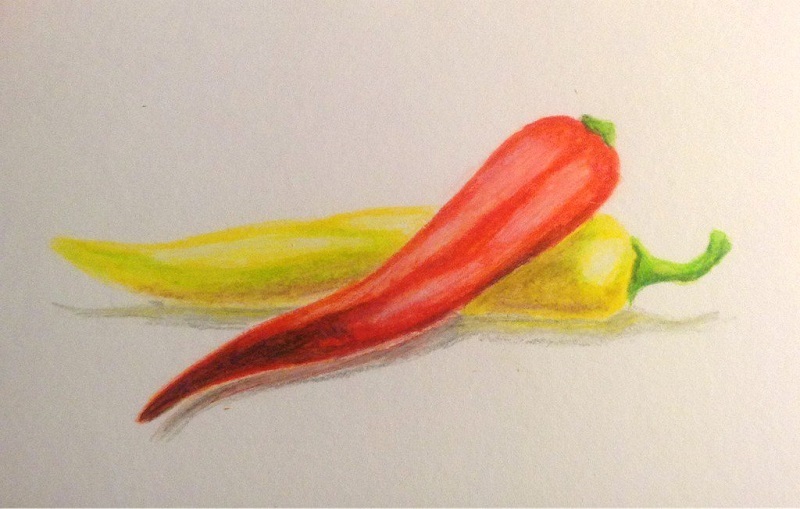 Draw the outline of the red and yellow chili peppers in Orange and Canary Yellow, respectively, and the stalks in Spring Green. Add a little Orange to the shadowed areas of the longer green stalk. Leaving white areas for the highlights, layer Lilac and Spring Green into some of the shadowed areas of the yellow pepper and Canary Yellow into the lighter yellow areas. on the red pepper, colour in the shadowed area long the bottom right of the pepper with a layer of Violet, and then go over this (and the rest of the pepper aside from the highlights) with Poppy Red and then a light layer of Crimson Red. Finally, add a light shadow under both peppers with French Grey 20%. Wet a watercolour brush and go over the colour you laid down in step 1. Start with the lighter areas and then merge into the dark areas; if you do it the other way around, you’ll end up pulling dark colours into your light areas and muddying them up. For the most part, you should be avoiding the highlight areas you’ve left white, but once you’ve dissolved most of the colour, pull a little of the surrounding colour into the white areas to get rid of the stark white of the paper (it should still be much lighter than the rest of the peppers). Let this dry, and then start building up the next layer, beginning with more Violet in the shadow area of the red pepper (towards the tip and along the lower edge where it meets the yellow pepper). If you haven’t already, apply some water to the grey shadow under the pepper to reduce any harsh edges. Continue to build up layers using the same colours from the previous steps. Use Spring Green and Lilac in the shadowed areas of the yellow pepper, and Canary Yellow and a little Spanish Orange in the lighter areas. Add a faint layer of Canary Yellow to the highlight areas of the yellow pepper – make sure it’s still noticeably lighter than the rest of the pepper – then add a layer of White. For the red pepper, bring more Violet from the tip of the pepper up along the lower edge, and go over the whole pepper (minus the highlights) with another layer of Poppy Red and then Crimson Red. Add a layer of Crimson Red with light to medium pressure to the highlight areas, and then go over this with White. Colour the green stalks with another layer of Spring Green, and apply Grass Green to the shadow areas. Blend the colours again with a brush that is only slightly wet; you want to ‘melt’ the colours together without washing it out into a paler colour. Add another layer of French Grey 20% to the shadows under the peppers, then add some Canary Yellow to the shadow under the yellow pepper and Crimson Red to the shadow under the red pepper. For the darker shadow areas under the red pepper, add a layer of Cool Grey 50%. Gently brush the edges of the shadow with a half-dry brush to soften the edges. Go over the dark areas of the red pepper with Violet again, adding some Dark Green to the very dark areas near the tip. Add another pale layer of Crimson Red to the highlight areas and then another layer of White, using medium to hard pressure. Colour the whole pepper aside from the highlight with more Poppy Red and Crimson Red, merging this into the highlight areas to reduce the harsh outline of the highlight. Using the White, add some marks perpendicular to the direction of the pepper near the shadow area to create some texture, then go over the lightest area of the highlight with White to create the impression of the pepper’s shiny smooth surface. On the yellow pepper, where it meets the red pepper, add a faint area of Crimson Red to show the reflected light from the red pepper touching it. Layer more Canary Yellow and Spanish Orange over the yellow pepper, smoothing out the transition between the shadow areas and the lighter areas. Add more Orange to the dark areas of the green stalks, then go over these with Spring Green, adding another layer of Grass Green for the shadowed underside. 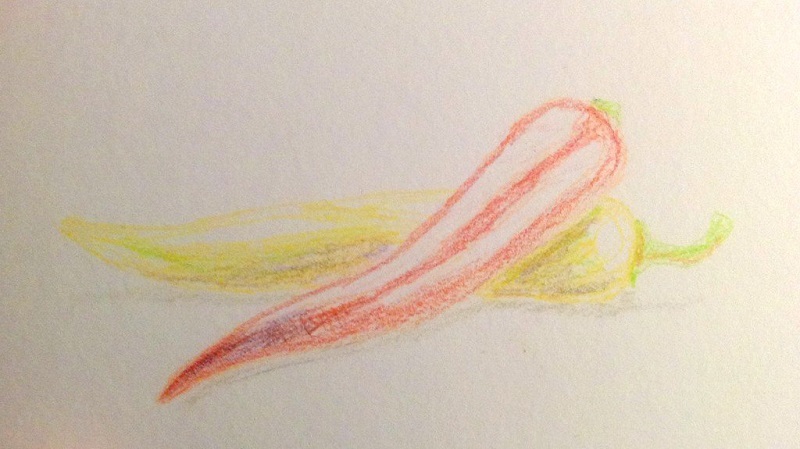 Using White, add a thin line of reflected light along the underside of both peppers from the surface they’re resting on (clean the pencil between the two peppers, or you will contaminate one with the colour of the other). 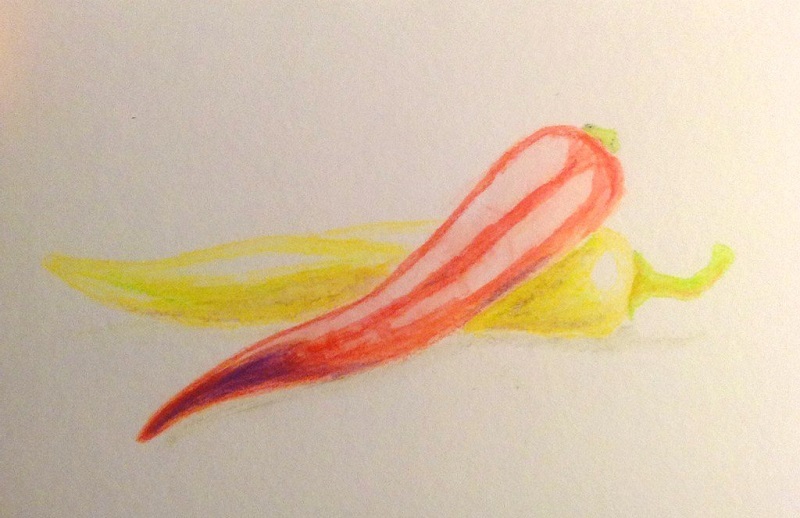 Add another layer of Canary Yellow to the shadow immediately under the yellow pepper, letting it fade out to grey towards the edges, then add another layer of Crimson Red to the red pepper’s shadow. Go over this with French Grey 20%, then add some Cool Grey 50% to the darker shadow under the red pepper. Now all that’s left to do is sign your name under the peppers using French Grey 20%. Thus concludes this watercolour pencil demonstration. As I mentioned near the start, I wish I’d chosen a sturdier paper as the Beta paper just didn’t have the tooth or texture to take very many layers. Still, I hope some of you find it helpful with regards to how to layer coloured pencils and how to use watercolour pencils. This entry was posted in Demonstrations, Pencils and Blocks and tagged Drawing, Painting, Premier, Prismacolor, Watersoluble. Bookmark the permalink.